It's a little last minute (so sue me!) 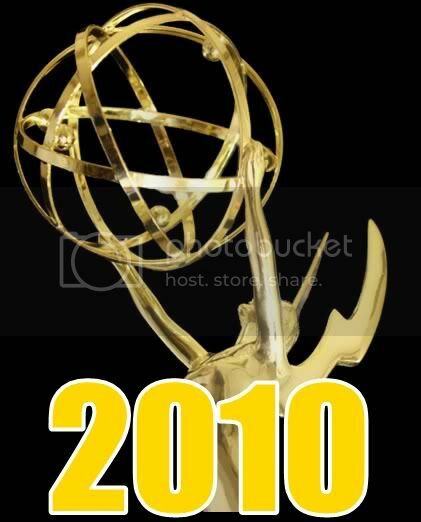 but I realized I forgot to post my 2010 Emmy predictions. Last year, I got 7 of 12 correct so not too shabby, but I feel like this year could be my sweep. I've got a good idea of who I think will win along with a mix of who should win and since they already announced Best Reality Show Host (Survivor's Jeff Probst, which I would've guessed anyways) I only have to get 11 right. This year, I'm even going a little step further: I'm going to explain why I picked my choice so it makes more sense and maybe to get some debates going. So, onto my predictions - my picks are in blue. UPDATED: We've got winners! I had a lot of misses, but I'm happy to report that the misses are ones I said I wish would win but expected the academy to vote for old favorites (except Kyra Sedwick- I mean, really?) That said this year I went 7/11 which is on par with my predictions last year, so go me! Winners highlighted in purple. There's still a chance Lost will be rewarded for it's 6 season run and it's beautiful ending (yes I loved it, yes I cry every time I see Jack and Vincent), but it can't tear me from Mad Men's season finale, one of the most exciting hours of TV. The end of Sterling Cooper and the secret meetings, plotting, and confessions leading to the formation of Sterling Cooper Draper Pryce has been etched as one of my favorite hours of television ever. This is the only category where I have watched every single show and every single episode; judge me if you must. Hands down, the best show this past year is Modern Family and it will win. Listen, Glee is a fun show and has funny moments, but it's not the best comedy. 30 Rock usually reigns supreme, but the show was uneven this season. I don't watch Breaking Bad (and I'd like to, I just don't have the DVDs and it's not OnDemand), but I know Bryan Cranston is amazing on it and sho-in to win. While Matthew Fox really turned it out in Lost this year, Hugh Laurie was excellent in the House premier, and Kyle Chandler finally got nominated, it's probably Cranston's award. I'd love to think Jim Parsons, the funniest part of The Big Bang Theory, will be rewarded for a job well-done, but I just see Baldwin getting the award again. Kind of a snooze, but whatevs. While sometimes I find Marguiles to be a total drip in the real world, she's excellent on The Good Wife (where sometimes he character is a drip too). I only started watching at the end of last season and fell in love with this well-written, amazingly acted show. But let me add, Connie Britton I wish this award could be yours because her portrayal of scorned principal Tammi Taylor was beyond great. I had a gut idea of who I thought I'd pick (it was Falco), but I did some searching to see what episodes were submitted and now I'm definitely saying Edie Falco. Toni Colette's submission, where all her personalities get unleashed in a basement tornado, is a good pick, but the pilot episode of Nurse Jackie is just too strong. Tina Fey, who typically we'd all pick, selected the "Dealbreakers" episode where all I can remember is she gets a talk show and horrible hair. Bad choice. Dual roles as the sad man of fate John Locke and the evil "get me off the island" Man in Black makes O'Quinn my pick. Seeing the juxtaposition of the flashsideways Locke living his ideal life and getting married, compared to the anger and duplicitious nature of the Man in Black, shows his stellar acting rage. I didn't even have to think for this one. When I saw a preview of the pilot for Modern Family, after the episode aired I said, "This guy [Ty Burrell] is going to win an Emmy this year." I'm not swaying. In the past I would've said "Neil Patrick Harris was robbed!" but HIMYM was weak this year (and by weak I mean terrible). Anyone from Modern Family could win and make me happy, but it's totally Ty Burrell's. My pick: Archie Panjabi. Perhaps my most difficult category by a landslide because it's a battle between the ladies of Mad Men and The Good Wife. I again turned to episode submissions to really evaluate their work. Hendriks picks the episode where Joan leaves Sterling Cooper to become a housewife and then the guy's foot gets run over by a tractor, which was a great episode for her but it didn't feature like a mind-blowing dramatic moment. Moss' episode is where Peggy deals with being a woman in a man's world and picks up some guy at a bar; too bad this didn't leave an impression for me cause all I remember is Sal re-enacting Ann Margaret in Bye Bye Birdie. Christine Baranski's episode didn't remind me of any crazy court scene drama, but her scenes with Gary Cole were good. Archie Panjabi's submission was my favorite, which is why I'm going dark-horse and picking her. In this episode, her character Kalinda solves the murder mystery of the week using her sort of seductive skills but nails a hilarious court room testimonial, SERVING the judge and other powerful politicians. Any time there's a SERVING, I gotta reward it, but I think I'll get SERVED here and Christine Baranski will win for being Christine Baranski. The easiest pick of the night by far; there's no contest. Glee will be rewarded for it's strongest part of the show: the hilarious Jane Lynch. To be blunt, without Jane Lynch, Glee is nothing. No one else here so even be stressed. Enjoy the bar, get dressed up, meet the cast of Lost. Despite a weak season, The Amazing Race will win again. It should be Top Chef but until TAR is cancelled, this show will continue to sweep for its production values.